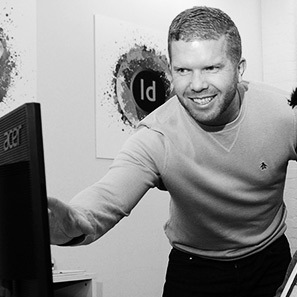 I'm Mark the director of Creative Studios Derby Ltd. I have been an Adobe software trainer for 11 years now and previously to that worked as a Graphic Designer for 6 years. I have a lot of experience training individuals and groups at all levels, from small freelance individuals up to multinational companies. Creative Studios Derby Ltd is the East Midlands (UK) largest and most experienced Adobe training studio. We specialise in teaching software from the Adobe Creative Suite, this includes Photoshop, InDesign and Illustrator. We regularly provide staff training for Thames Valley Water, EON, The Derby Evening Telegraph, Derby College, Derby University and The University of Nottingham to name a few. We have also helped hundreds of small businesses to realise the potential of affordable Adobe software to help promote and raise the profile of their businesses. I am sure you will find our on-line courses informative and easy to follow, we have many satisfied customers who keep coming back for more and we want you to be one of them too! Go from complete beginner to InDesign wizz in no time with the help of a time served InDesign expert! With our online InDesign training course videos you will learn how to master the full power of this industry standard page layout programme, in no time you will be creating stunning newsletters, brochures and posters. It doesnt stop there though, after you have grasped the fundamentals we then move you on to learning all the fantastic interactive elements that you can add to your PDFs for online use. Right click on the folder to download all the images you will need to complete the online introduction to Adobe InDesign course. Here we look at the general workspace in InDesign, learning how we can control and customise the various panels and menu items that InDesign has to offer. We will look at the correct method of placing and linking images to your InDesign documents. A lesson explaining how to increase/decrease your image sizes and also rotating them. In this InDesign lesson we will place multiple images in at the same time and group them together. We will look at how you can place multiple images in to a grid placement within InDesign. Repairing broken links to your images and replacing your images within your InDesign documents. How to apply curved corner edges to your frames. Adding/deleting and effectively using the layers panel with InDesign. Applying various effects to your image frames including drop shadows and feathering. How to add delete and organising the colours within your InDesign swatches panel. Looking at how you can apply the various swatches to both the stroke and fill of your frames. How to add, delete and reorganise all your InDesign pages within your pages panel. Create text frames and learn how to thread the text in to other InDesign text frames. Here we will look at how to use your swatches panel to add colour to your text and the text frames. We will adjust and apply a baseline grid to the body text to ensure perfect alignment. A look at the text and paragraph panels to format the text content. Applying a text wrap to both images and text frames using the InDesign Text wrap panel. Using the gradient feather tool to merge images together along with the transparency options. Creating and saving an InDesign Library to reuse your content on other InDesign documents. A detailed look at setting tabs so we can get perfectly aligned text lists. A look at the master pages within the pages panel to create consistent page templates. Duplicating master pages and applying the master to various pages within your InDesign document. Applying special characters to your master pages to produce automatic page numbering on all your InDesign documents pages. Using the character styles panel we will create consistent character styles for our body and header text. Using compound paths we can merge frames together to carry a single image in InDesign. Using clipping paths we can automatically crop images in to InDesign frames. Run your text along any path that has been created with InDesign. Here we look at the effects panel in more depth, applying effects with more precise control. Using the pathfinder panel we can merge delete and cut out frames with each other to create more bespoke shapes. A look at the Pen Tool, why we use it and the benefits of mastering it for not only Adobe InDesign but for all Adobe applications. A more in-depth look at InDesign’s pen tool, drawing a bespoke frame to crop an image. Pre Flight checking your InDesign document to find any errors that may need fixing before sending to print. Using the Pre flight to check that your swatches and bleed in your InDesign documents are set correctly for print. Create your own pre flight pre-sets within InDesign. Package all your links and fonts together in to a single folder for archiving or passing on to somebody else to edit. Exporting your InDesign document in to a lo-resolution PDF format for on screen or web use. Exporting a Hi-resolution PDF from your InDesign document ready to send for hi quality print output. Add interactive buttons to your InDesign pages so when you export a PDF the user can flick between pages. In this video we will look at how to create interactive image galleries with Adobe InDesign. We will use multistate objects to create the gallery and export as flash files to be reimported in to the InDesign document and exported as a PDF. © 2014 - Creative Studios Derby. All Rights Reserved.